Since 2008 I have had the pleasure of serving on the National Center for Economic Gardening’s (NCEG) Strategic Research Team as a founding member and the GIS Specialist. While working on more than 600 small business engagements, I have had the opportunity to interact with an elite team of other specialists in market research and SEO and internet marketing. 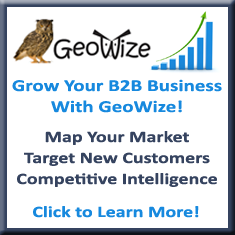 My exposure to these other specialist helped me to understand that it is time to update and improve my GeoWize website. First off, it was too static, and my blog was isolated and disconnected. Additionally, managing of all of the GeoWize internet related services: domain registrations, website hosting, website administration, email, blog, etc., was disjointed and required me to interact with a large, impersonal corporation. This past June while attending the National Economic Gardening Conference in Kansas City, MO I had the pleasure of meeting and visiting with Mike Bosch, the President/CEO of The Reflective Group. I was immediately impressed with the mission and vision of The Reflective Group. Among their comprehensive suite of services for supporting small businesses, I learned that Reflective provides website development services. In discussing our GeoWize internet/website issues with Mike I found his depth of understanding in this area impressive, and I decided to pursue the possibility of working with The Reflective Group for this critical migration. Working with the professionals at Reflective was a real pleasure. They were extremely knowledgeable and provided the needed expertise to guide my decision making for the new sites design and content elements during this migration process. Their one-stop, turn-key capabilities allowed me to bundle a number of assorted web and email services into one relationship with one, very responsive organization: The Reflective Group. Whenever I had questions or issues, the folks at Reflective always had answers, and they were always “right-on”! It is a pleasure to work with a small business that understands small business, and is not a big, impersonal corporation. I strongly and enthusiastically recommend The Reflective Group to any business needing expertise in website development or migration, and I would make the same choice again to work with Reflective.